How did an introverted writer who used to hate public speaking find the courage to take to the West End stage in her own solo theatre show? Yang-May Ooi, writer and performer of Bound Feet Blues – A Life Told in Shoes, reveals on the Ginger Public Speaking blog her fearlessness secret to supercharge your confidence as a public speaker. Click on the image below to read the full article on the Ginger Public Speaking blog…. Ginger Public Speaking is a public speaking coaching company founded by Sarah Lloyd-Hughes, a popular speaker on confidence and inspiration and an award winning social entrepreneur, whom I am honoured to call a friend. Featured in the TEDx series of public speeches, Sarah is an energetic, original and deeply authentic speaker who works with professionals and entrepreneurs to help them communicate with courage. She has successfully taught thousands of people across three continents. As a speaker on confidence, Sarah builds inspiration in her audiences, whatever their experience levels. She challenges and supports them on the journey to become passionate, authentic and inspiring communicators. Bound Feet Blues is part of the South East Asian (SEA) Arts Festival 2015! The SEA Arts Fest or South East Asian Arts Festival has been a key supporter of Bound Feet Blues from the very beginning. One of the festival’s producers Annie Kwan saw writer/ performer Yang-May Ooi’s scratch night performance of the draft work in March 2014 at Conway Hall and invited Yang-May to bring it to the festival later that year. 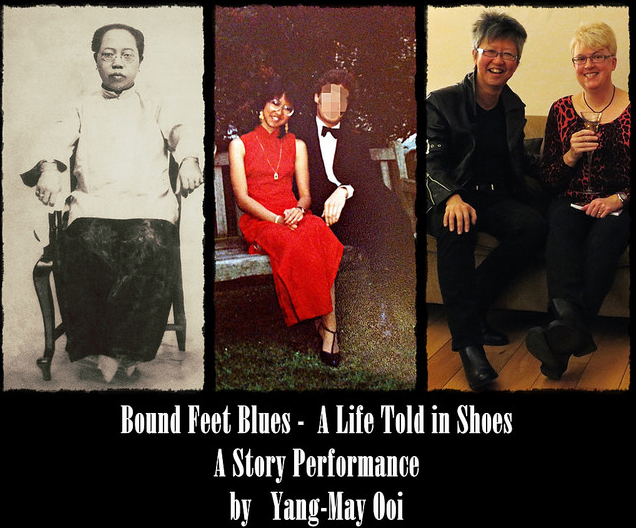 In October 2014, Yang-May showcased the completed version Bound Feet Blues for one night only as part of the SEA Arts Fest 2014 to a sold out audience and garnered 4+ star reviews. This year SEA Arts Fest 2015 is championing Bound Feet Blues again, scheduling the full production as part of the festival. We are grateful to festival director Hi Ching and his team for their ongoing support and enthusiasm for the show. SEA ArtsFest is the first Southeast Asian arts festival in the UK, championing and developing the work of the artists of Southeast Asia and those inspired by Southeast Asia. SEA ArtsFest brings together artists, practitioners, makers and thinkers to increase awareness of SEA Arts and its audience base, and is supported by Arts Council England. The festival features an exciting range of work including film, theatre, music, traditional and heritage arts, outdoor performances, participatory workshops, digital media-based projects, roundtable discussions, and more, taking place across multiple locations in London and other parts of the UK. The inaugural festival took place between 1st October and 10th November 2013. SEA ArtsFest 2015 will be taking place between 26th October and 13th December 2015. Kristian Morgan is an unofficial member of the Bound Feet Blues team but he has the important role of working with writer/ performer Yang-May Ooi on her fitness and stamina for the challenging task of performing on stage for 5 nights a week over 3 weeks. Kristian is a freelance mobile personal trainer based in Dulwich, South London. He is a national ultra marathon 50k champion. He has completed over 50 marathons and ultra marathons (an Ultra is any distance greater than 26.2 miles). He is also an ironman triathlete but most of all he is a friendly approachable personal trainer. Bound Feet Blues is a solo theatre performance – but on an epic scale. Writer/ performer Yang-May Ooi takes the audience across continents from Asia to Europe and Australia. 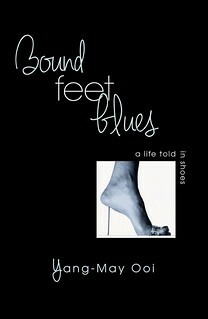 We’ll be sharing with you the landscapes of Bound Feet Blues here on this blog over the next few weeks. Today, the vast desert scenery of the Australian Outback. Crin Claxton will be running the show for each performance, taking care of all the technical and behind the scenes details as the production manager to make sure each night goes off without a hitch. Yang-May Ooi, writer/ performer of Bound Feet Blues talks about the lack of East Asian stories in UK mainstream media and what could be done to redress the balance. Hua Tan travels between Shanghai and London, working on diverse productions from Chinese language dramas and operas to international collaborations like the National Theatre’s Chinese language production of War Horse. She has created an amazing set for Bound Feet Blues as well as complementing Yang-May’s performance with a nuanced and atmospheric lighting design. Yang-May Ooi, writer and performer of Bound Feet Blues, has been featured in Nee Hau, the online magazine for British Chinese and East Asian culture. You can read the full article by clicking on the image below. Here is an extract: “From internationally best-selling fiction author to performing her personal story, with a three-week run at Tristan Bates Theatre scheduled from November 24th to December 12th2015, Yang-May has evolved to become the confident storyteller she is today, shining in her 50s. The show is part of the South East Asian Arts Festival 2015 and funded by The Arts Council and The Housing Finance Corporation. Yang-May is supported by a team of experts including Jessica Higgs, creative director, Eldarin Yeong, producer and Hua Tan, theatre designer.” Read the full article..
My dear friend “Walter Plinge”, a retired actor, passed away a few weeks ago. I interviewed him in 2006 on my Fusion View podcast for the London Theatre Blog and in his memory, I am publishing again the podcast in its entirety below. He talks about his life as a repertory actor in the 1950s. It is a fascinating journey into history and into the craft of acting for anyone who is interested in theatre – and a lovely way for me to remember “Walter”, especially his warm, resonant voice that has a touch of Anthony Hopkins to it. For a solo show like Bound Feet Blues where Yang-May is the sole performer and focus, holding the stage for an hour, Tristan Bate Theatre is the ideal venue. The theatre space is intimate, seating 60 people, and yet can seem vast as is appropriate for the epic quality of the story.